How many CME hours are required for MD/DO renewal? 20 hours per year. CME hours must be from birth month of previous year through birth month of current year. Starting January 1, 2013, 50% of CME hours must be Category 1 and in the physician’s primary area of practice. What is Healthcare Provider CPR? Healthcare Provider (HCP) is a course authorized by the American Heart Association. A comparable course is “CPR for the Professional Rescuer/AED”. Other combinations of courses do not equal Healthcare Provider. It consists of the following 6 modules: Adult and child CPR, Pediatric basic life support, Adult and child foreign body and obstructions, Two-man CPR, Barrier devices, Automatic external defibrillator (AED), ACLS and PALS can be substituted for HCP. Select: Dental Practice Act Article XIV: MINIMUM CONTINUING EDUCATION FOR DENTISTS AND DENTAL HYGIENISTS I. Cardiopulmonary Resuscitation: Each licensed dentist, dental hygienist, and registered dental assistant must take a Basic Life Support level of cardiopulmonary resuscitation course and submit a photocopy of the cardiopulmonary resuscitation card or certificate with the renewal form that confirms that he or she holds at least a current certificate in cardiopulmonary resuscitation of Basic Life Support level, effective January 1, 2003. 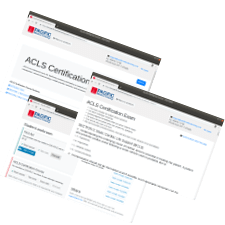 The hours dedicated to obtaining a Basic Life Support certification can be used toward CEUs. 02-06-0003—IMPLEMENTATION OF PHARMACY CONTINUING EDUCATION (3) A minimum of twelve (12) continuing education hours of the thirty (30) required hours, must be accredited by the Accreditation Council for Pharmacy Education. Pharmacy Regulations - Regulation 9 Patient Counseling 09-00-0002—PRESCRIPTION ORDERS TO ADMINISTER MEDICATION AND/OR IMMUNIZATIONS (D)obtain and maintain current certification in Cardiopulmonary Resuscitation (CPR) or Basic Cardiac Life Support (BCLS), these certification courses must be accredited by the American Heart Association and must contain a live component where proficiency is tested; and (E) successful completion of the above described course of study may be accomplished by: (i) successfully completing the Board-approved course of study in a College of Pharmacy curriculum; or (ii) successfully completing an American Council of Pharmaceutical Education (ACPE) Certificate Program of not less than twelve (12) hours on the course of study described in paragraph (b)(5)(B) above. ARKANSAS STATE BOARD OF HEALTH SECTION 4. ARTIST LICENSURE RULES AND REGULATIONS PERTAINING TO BODY ART ESTABLISHMENTS 4.3. The following requirements must be completed before any individual shall receive a body art license: 4.3.1. Prior to applying for a body art license, the applicant must complete blood-borne pathogens training which meets the requirements of the Occupational Safety and Health Administration (OSHA) and is approved by the Department. 4.3.2. Artists in training pursuing licensure for scarification shall also complete basic first aid and CPR training, which is approved by the Department. Total number of locations: 20. These locations CAN provide American Heart Association-branded provider cards if needed.